A flowery beach dress has its own style and elegance. It has perfect combination of Indian embroidery work and Western style. This long sleeve beach dress has its own feminine grace for any lavish resort and beach. •	Enticing prints and embroidery. 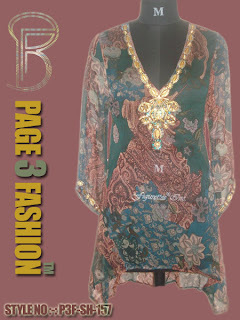 •	Finished from fine quality Viscose Chiffon fabric. •	It carries a sense of comfort and luxury.